The Pirelli W240 SnowSport performance winter tyres were developed to combine good snow and ice traction with superior winter driving performance. 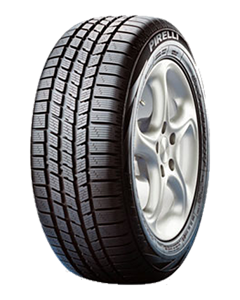 With a range including low profile, high-speed sizes, Pirelli W240 SnowSport tyres are for the drivers of high performance sport cars and high powered saloons who require winter driving traction on dry, wet and snow-covered roads. Pirelli W240 SnowSport studless winter tyres have an asymmetric tread design featuring broad, rounded outer shoulder blocks to maximise dry road handling performance. These are combined with independent, intermediate tread blocks separated by wide circumferential grooves enhancing wet road traction and resistance to aquaplaning. The tread blocks also have a variable geometry design (slightly different sizes and shapes) combined with transverse sipes to produce the multiple biting edges that help grip snow and ice. A pure silica tread compound is used allowing excellent winter traction without reducing high speed durability. Sorry, we currently do not have any tyres with the Winter 240 SnowSport pattern in stock.